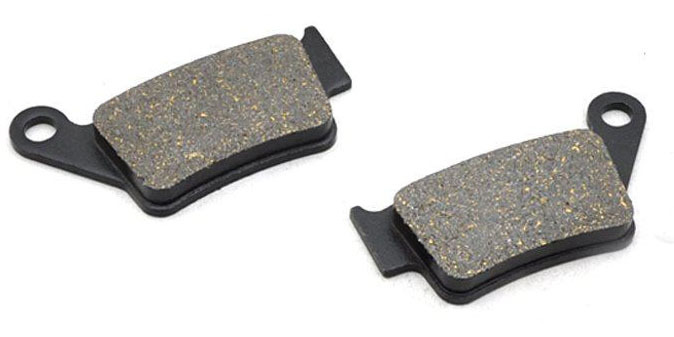 The rear brakes on my F800GS were making a bit of a grating noise on the way home from work today. I had a look when I got home and noticed the pads, which were last replaced in Austria in 2013, were down to the metal. Fortunately there was no scoring on the disc. It’s not like me to have things like this go unnoticed—I check the pads regularly but I don’t remember them being anywhere near this close to the end of their lives. Admittedly the F800GS chews through rear pads like a fiend because the soft front forks require a healthy dose of rear braking to help counteract the front end diving under braking and keep the bike balanced. Lesson learned—check the rear pads a bit more thoroughly and a bit more often. I called the dealership to have them put aside a set of pads and rode there straight away without using the rear brake at all. Although I’m in no way a mechanic, it had to be done immediately as my R1200GS is in getting the crash damage fixed and one more ride probably would have permanently scored the disc. And who knows when the next available appointment at the dealership would be, since a lot of people are having their bikes serviced for winter storage this time of year. I found the following excellent instructional video on YouTube which I watched twice before heading downstairs with a few tools and a pair of surgical gloves (my soft, office-worker hands wouldn’t take kindly to being accosted by toxic brake grime). The Brembo brakes on the F800GS provide incredibly easy access to replace the pads—removing a single clip and a pin enable the pads to come out, with the caliper still bolted in place. The old pads were at about 0.5mm on the inside and less than 0.1mm on the outside. Shame on me. The new pads took a little bit of manipulation to get in (compressing the piston and being careful not to disturb the tension spring) but everything went back together just as easily as it came apart. After a two mile ride the brakes already felt bedded in, having lost the ‘wooden’ new pad feeling quickly. The disc is a different matter—it will need replacement once these new pads wear out, as it has developed a bit of a lip on the edge and is no doubt at the limit of its safe specification. While BMW’s pricing is reasonable for the pads, they want a thieving £200 for a new disc. Brembo, who actually manufacture the brakes, only want £66 for the same part (68B407C0) which is indistinguishable from the OEM version (incidentally, the pads cost the same from Brembo and BMW). Feeling quite proud. Call me indolent, but normally I can’t be arsed to faff about when I can pay someone else to do things like this for me. Indeed, my dealership only charges £50 altogether to replace the pads which means I only saved £16—however, £16 is £16, and now that I know how easy they are to replace, I have no excuse to be lazy in future.